As an innovative leader in technology, Agero has re-defined the way our Service Providers receive dispatch information. Our Digital Dispatch capabilities include easy and open communication with our Service Provider Network, and industry- leading tools that expedite and enhance our ability to provide an unparalleled level of efficiency. Our dispatch solutions are designed to let our Service Providers deliver the best customer experience possible. RoadsideConnect™ is an invaluable tool to help you manage your business. It allows you to accept Agero jobs right from your phone, assign a driver with the push of a button, get hands-free auto status updates and more. Providing location and status updates via RoadsideConnect, or any 3rd party tool such as Beacon Software, will help you run your business more efficiently and increase volume, all while improving customer satisfaction. 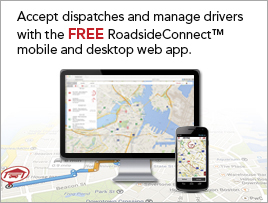 If you haven’t already, make sure to log in to RoadsideConnect to help you seamlessly dispatch jobs from either your desktop or smartphone. If you've already made an investment in software for your business from one of your partners you can sign up for electronic dispatching directly with them. You will pay our partner directly for their software and services. Our partners allow you to receive electronic dispatch requests from Agero and other motor clubs.